If you are unfamiliar with the finer qualities of goats, you may not be able to identify the differences between wild and domesticated varieties. If you're in the market for a goat -- whether as a pet or breeding stock -- it's important you understand the differences between a wild goat and tame one. Wild goats are, first and foremost, wild animals. This means they are not accustomed to humans. Wild goats do not rely on humans for shelter, food or medical care. Domesticated goats have been more or less tamed by humans. Domesticated goats are cared for humans, who provide them with their basic needs. A wild goat is unlikely to approach a human willingly and may react fearfully if a human approaches him. Wild goats can bite, kick or even gore humans with their horns when they feel threatened or frightened. Domesticated goats are used to being in close proximity to humans, and while they can still behave in a dangerous manner if threatened, they are less likely to cause serious injury than a truly wild animal. Wild goats reproduce as the urge strikes them with no consideration spent on the age of the animal or the physical qualities he possesses. Weaker individuals are more likely to die in the wild, but if they do not then they most likely will reproduce. Domesticated goats are intentionally bred with certain characteristics in mind, resulting in different breeds of goats. Better quality offspring are created by culling undesirable animals from the breeding program. 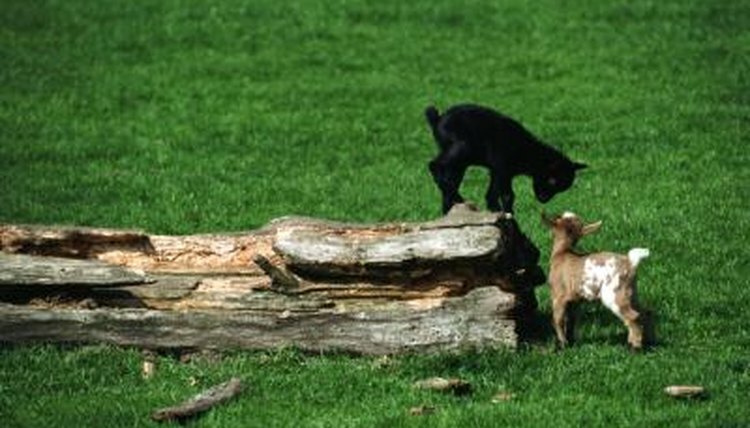 Many "wild" goats are actually the result of escaped domestic goats who went feral. However, any goat who has not been tamed or handled by humans should be viewed as wild from a safety standpoint, because a frightened, uncivilized goat will need to be dealt with in a matter that minimizes the risk for everyone involved. If you are looking for a pet goat, stay away from any animal that is wild or has not be handled. Goats need to be tamed before they will be friendly, and untamed goats are difficult and often unpleasant to handle. What Types of Predators Attack Goats? Do Cows Make a Different Sound Besides Moo? What Do the Horns Look Like on a Male Nubian Goat? What Are the Names of Male, Female & Young Goats?